A vestibule is a completely enclosed unconditioned space that separates the interior of a building from the exterior. It creates an air-locked entrance and acts as an entryway into a larger space, such as a lobby. Its purpose is to reduce stack effect (air movement caused by warmer air rising and colder air falling), and the amount of air infiltrated by wind at a building’s primary entrance. The primary entrance of a building has the highest volume of pedestrian traffic and is typically used by the general public, as opposed to private entrances and doors used by employees. 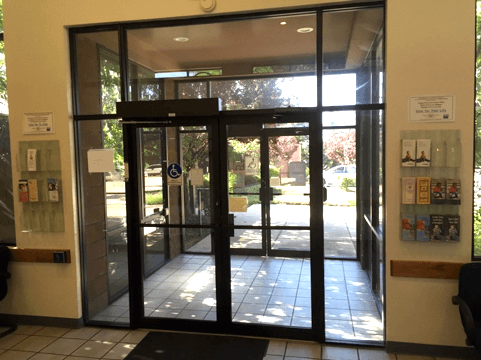 A vestibule increases a commercial property’s energy efficiency and improves the comfort of occupants located nearest the primary entrance. The 2012 International Energy Conservation Code (IECC) requires that primary entrance doors leading into a space greater than 3,000 square feet, which cannot be closed off from the entrance door, have vestibules. All doors opening into and out of the vestibule must be equipped with self-closing devices that do not open at the same time. However, the 2015 International Energy Conservation Code (IECC) published by the International Code Council (ICC) announced that air curtains can be installed as an alternative to vestibules. For more information about air curtains, read CCPIA’s article Inspecting Air Curtains. 7. an air curtain is installed at the building’s primary entrance. 1. Verify that spaces larger than 3,000 square feet contain a vestibule or is exempt. 2. Verify that the doors leading into and out of the vestibule are equipped with self-closing door devices. 3. Verify that the interior and exterior doors of the vestibule do not open at the same time. Inspecting vestibules lies beyond the International Standards of Practice for Inspecting Commercial Properties (ComSOP), but commercial property inspectors may choose to exceed the ComSOP and offer their insights and observations to property owners. Commercial property inspectors should refer their clients to a licensed architect or building code official for further examination. Vestibule requirements and exemptions may also be subject to state and local building codes.